I have given a lot of talks over the past few years and I’ve seen more than I can count. This year I saw one of the worst presentations ever – literally in my life I’m pretty sure I’ve not seen one as bad – and I’ve also seen some of the best. I’m starting to piece together what makes a talk good and bad, and I can generally tell within seconds how it’s going to go. A key component in the personality of a speaker is their choice of software. I definitely have opinions on the different presentation tools, so here they are. If you don’t want to read 1,500 words about slide decks and speaker tools then you had best stop reading now. Okay, you were warned. Let’s start with the old favourite: PowerPoint. Like Microsoft Word, PowerPoint is synonymous with what it does. People ‘give a PowerPoint’ and ask for your PowerPoint file when they’re actually asking for your slides. Many people don’t even know there are other tools available. PowerPoint hasn’t improved in years, and as such it’s still possible for people to include flashing lights, window-blind transitions and even sound effects (the greatest of all presentation sins!). I haven’t checked, but I think you can still put a MIDI tune into PowerPoint. PowerPoint is perfectly capable of producing beautiful slide decks and lets speakers use presenter display (if the sight of it doesn’t make them think their machine is broken). PowerPoint’s modern templates are attractive but because they are so widely used, one should essentially avoid them, or at least significantly modify them. 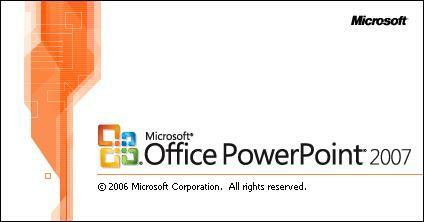 It remains the most popular way to give a talk, and many people have no choice but to use PowerPoint. Many poor souls are forced to use their company’s ill-fitting slide template with its horrible colour scheme. Is it just me or are all ‘company’ PowerPoint themes odious? 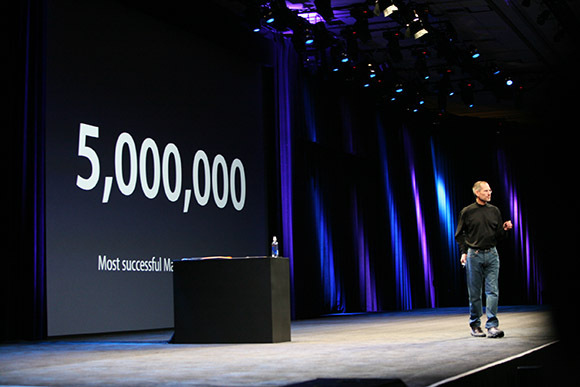 For Mac users there is Keynote: PowerPoint’s more experienced older cousin. Keynote wears sunglasses, smokes roll-ups and was making slides before it was cool; PowerPoint wears a Members Only™ jacket and remembers how nice pastel colours were in the 1990s. Keynote is close enough to PowerPoint that is pretty easy to learn the basics but also has a plethora of advanced features and tools that actually place it in a different category. That’s not to say that every Keynote talk is automatically superior of course, just that in the right hands Keynote can produce far more professional presentations. Keynote’s major weakness is the dreaded Presentation Laptop. This is the laptop you often have to use, but cannot predict. You are usually only even told about it hours before the talk – sometimes not at all! The Presentation Laptop is usually a Windows Vista machine with PowerPoint 2000 installed and an odd obsession with trying to update Adobe Something to a new version during your talk. Keynote users must then either convert the talk to PowerPoint and risk everything going wrong, or export the talk to PDF and risk requiring your host to conjure someone from IT Support to open Adobe Acrobat for them (after first upgrading Adobe Something of course). It isn’t Keynote’s fault exactly, but if will insist of using the hipster presentation tool for the hipster laptops, then you sort of have to expect it. PDF is the third way to give talks in general. Usually the PDF folks have long given up on all the above hassles and happily forsaken slide transitions or presenter display. PDF talks often mean that the speaker either prepared a lot for the talk or that they’ve given this talk before. Either way it’s a good sign more often than not. PDF talks are also favoured by the Linux crowd and so you probably know that they are standards compliant and maybe even Creative Commons licensed. Now let’s cover some of the less well-known but still tragically-common ways to give talks, and let’s start with my least favourite: Prezi. 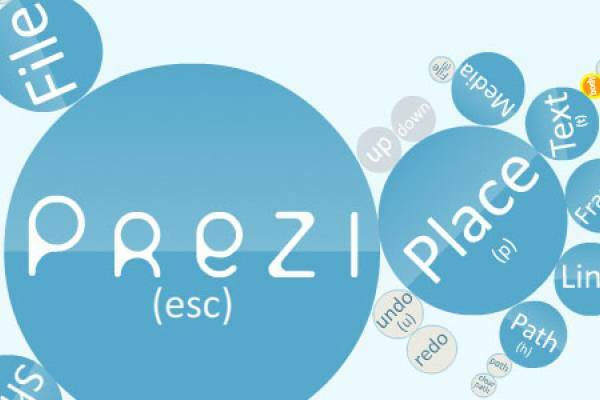 Prezi is pretty awful and you know it. No come on, when someone stands up to give a Prezi presentation your heart sinks a little doesn’t it? Mine does. No one actually uses Prezi differently to PowerPoint or Keynote, they all effectively show us slides regardless of Prezi’s infinite-canvas concept. It’s a wasted opportunity that’s normally incompatible with the laptop at the podium and often requires several minutes of tech support. Prezi presentations were going to redefine talks – I know I was excited about it at first – but then reality set in. Creating talks in Prezi is a woeful experience. The software is sluggish and has a steep learning curve and you alway seem to have to update it. Then once you’re into the flow you have to steadily unlearn years of presentation norms if you’re going to actually make it worth using something other than slides. Prezi talks nearly always hit a tech problem and suffer even more than Keynote when faced with the loathsome Presentation Laptop. If you’re a Prezi convert – and it does appear to be a religious experience – then you may be reading this thinking ‘but he clearly hasn’t tried to use Prezi‘. Rest assured I really have. We’ll just have to agree to disagree, and by that of course I mean agree that I’m right an you’re not writing this. There’s also the rising trend for browser-based presentations. As if browsers aren’t abused enough. 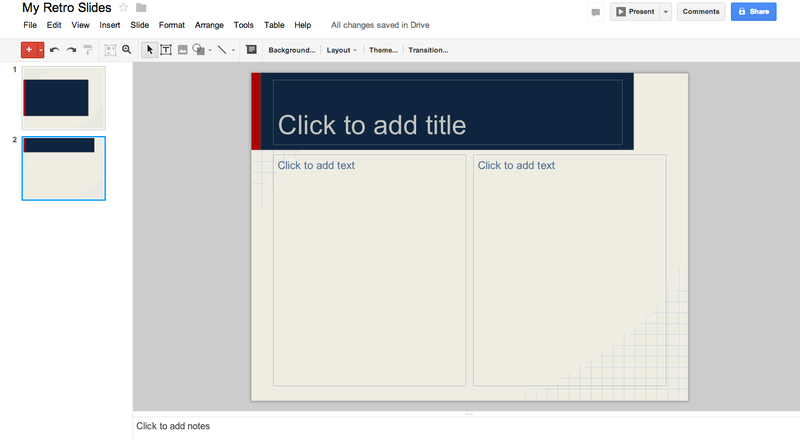 Google’s online presentation tool is essentially PowerPoint 97 in a browser. Sound like a bad idea? That’s because it is. It is at least slowly getting better all the time though, and has the advantage of working across a lot of operating systems. I’ve also seen several people roll custom HTML-based slide decks. These are often very attractive, and means you can easily incorporate websites into your talk, but because they are done by developers they’re nearly always version 0.1 and riddled with bugs. If the setting is fairly informal then this can be impressive and charming, but in more professional spaces it can be a curse. Finally a word about talks without slides of any kind. At least some of you will have read this and been saying to yourselves ‘in my day we did talks with nothing but a blackboard/whiteboard/cave wall and they were some of the best talks I’ve seen‘. Well you may be right (although clearly talks were still bad then too) but images, movies and charts are so often required for talks today that I’m afraid it’s too late. It many cases the images, movies and charts are all that is required but often they are crucial to the topic being discussed. It is usually hugely beneficial to talk to the public about astronomy with the aid of images; it is difficult to give professional financial talks without charts of some sort. In web development, screenshots are often required. There is absolutely still a place for oratory and I love speakers who can perform in this way. But let’s not pretend that it would be good or everyone to do this. Not everyone is Barack Obama and not everyone has the time (or the speech writers) to become him. The awful truth is that without PowerPoint, Keynote, Prezi – and the rest – most talks would be even worse; we should grateful for the fact that despite the collective failings of these tools, people still manage to give talks at all. I once turned up for a talk and was told that using my own laptop would be fine, despite the ominous presence of a ‘presentation’ device. However when my talk arrived there was no VGA port – or indeed any port – available. The laptop was plugged into an odd docking station instead. The IT guy had to go and fetch a cherry picker in order to plug-in a ten-foot VGA cable for me to plug into. Luckily they looked far sillier than I did, and the audience found it funny. Shocking. Personally I used Keynote but these days try to ensure that any slide deck will look 95% fine as a PDF. This avoids the dreaded Presentation Laptop, and mental anguish in general. Nice article! After giving one disastrous talk, in which the Presentation Laptop failed to load the images in my Keynote talk and whilst explaining the missing figures I accidentally drew on the wall behind the projection, I’ve firmly stuck to slides made with Powerpoint and converted to PDF. Avoids much embarrassment! I think one of the biggest problems with modern seminars/conference talks is that scientists are taught (if they are taught at all in this area) to give slide shows and not to give oral presentations per se. The former is suitable for the holiday photographs, the latter is properly about communication. Computer projection has definitely improved the visual clarity of well given talks, but I’m neutral on the software itself. Sure Powerpoint and Keynote have their failings, but the user’s own failings in terms of design and communication sensibility are usually far more significant to the outcome of a talk. I absolutely agree Jason. Maybe we all need to fly-by-wire more in order to remember what talks are really about. Not entirely sure I agree with some of the sweeping statements (sorry, but PowerPoint HAS improved over the years…it’s just that people are stuck in the dark ages and don’t know how or frankly can’t be bothered to use them) but your point is valid. Most presentations are damned awful and it has very little to do with the software used and more to do with a complete lack of respect for the audience. If you do decide that your audience isn’t really worth spending too much time preparing and rehearsing for, do us all a favour and take it on the chin…don’t blame the software. In my organisation, it has become the de facto norm to use PowerPoint slides as reports and documents… This is A Bad Thing. When a document is required, say a design doc, you do not want to see it in PowerPoint format. When you need to provide a report on progress each week, using PowerPoint is about the worse tool I can think of. But organisations have become so wedded to PowerPoint as an information sharing tool, they seem to have forgotten that PowerPoint slides are good for one thing only – presenting something to an audience. Very interesting article! While it sounds like the author has indeed gotten hands-on with all these platforms, I still believe that most awful presentations exist either because the presenter spent the minimum amount of time preparing them or was unfamiliar with how to utilize the software features. I believe more presenters need to evaluate the importance of each presentation and consider using design assistance for those truly important opportunities–whether it be through an in-house marketing person, a college intern or a third-party company. Definitely mark me as a Prezi religious convert, but I agree with the author that most people fail to utilize the conceptual / spatial nature that the canvas offers and instead simply use it as a Powerpoint with “zooming” capabilities. 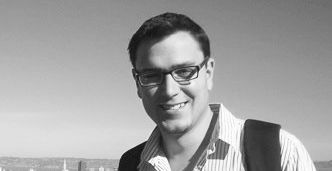 Great post- i have a different perspective, since I run both sides- a presenter and IT support for other presenters. I try to convert the PPTers to keynote- but they want to be dumbed down, despite the fact of the sweet keynote enabled presentation laptop. And Prezi- really is it supposed to be better? just annoying to me.